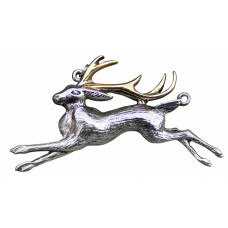 Order the Jackalope Pendant by Briar from Unicorn Design. The Jackalope for Warrior's Strength pendant is designed by the fantasy artist Briar and it is part of the jewellery series Bestiary by Briar. The Jackalope, an animal hybrid of a hare and an antelope, is famed to lurk within the woodland. This Bestiary Pendant is made of silvery zinc alloy, and accented with an turquoise colored glass cabochon. The pendant comes with a chain and a satin pouch, with the pendant's meaning explained on an enclosed card. Approximate size: 47 mm wide and 48 mm high.